Testing of reclosing devices (option PTE-FCE). 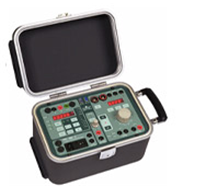 The PTE-100-C is a portable Universal test equipment for testing electromechanical, electronic, and digital relays. The equipment can output a variable current up to 250A, a variable AC Voltage up to 250V, a variable DC Voltage up to 350V. Also the unit incorporates a variable stabilized auxiliary DC Voltage supply up to 250V and a fixed AC Voltage output up to 110V, which can be variable with the PTE-FCF option. The equipment is extremely compact, and contains all the functions necessary for current and voltage relays. It incorporates various measurement functions such as a voltmeter, ammeter, frequency meter, as well as measures apparent power, impedance, and internal and external phase angles. From the front panel controls, the maximum output injection can be limited, used for example in testing instantaneous overcurrent relays. Injection time can also be limited, useful to safely test reclosing devices. The PTE-100-C can communicate with a PC via the serial port RS-232, and can be connected to other PTE units via the BUS-PTE. - Testing of overcurrent and minimum/maximum voltage relays. - Testing of overcurrent directional relays (option PTE-FCL). - Testing of reclosing devices (option PTE-FCE). - Testing of dc relays. - Verification of the knee point in current transformers. - Combined with the PTE-100-V, forms a complete single phase system, capable to test diferencial, sychronized, and inverse power relays, etc. - Variable current output up to 250 A. - Variable AC voltage output up to 250V. - Variable DC voltage output up to 350V. - Variable auxiliary DC power supply to 250V. - Auxillary AC voltage output of 110V. - Outputs are fully isolated and Electronically protected. - Timer resolution: 1 ms.
- Contains Voltmeter, ammeter, frequency meter, measures apparent power, impedance, and internal and external phase angles. - Control of injection time. - Control of the maximum value injected. - Current can be pre-selected. - 1,000VA for 1 minute. - Dimensions: 200 x 300 x 200 mm / 13.5 kg. 8 x 12 x 8 in / 30 lb.